In a reshuffling of the 2017-2018 cyclocross World Cup calendar, the former UCI CI race, Trek CXC Cup, becomes World Cup Waterloo and CrossVegas returns to its roots as a UCI C1 event. The new Waterloo World Cup will take place September 24, 2017, four days after the 11th edition of CrossVegas. Along with the World Cup race on Sunday, the Trek Cup will feature a slate of amateur USA Cycling racing on Friday and a UCI C2 event on Saturday. There will also be amateur races Sunday before the World Cup event. CrossVegas, now in its eleventh year, will return to its roots and be a C1 race for 2017. The change from World Cup to C1 for CrossVegas opens the door to many U.S. racers to secure early UCI points and will continue to be a showcase event and highlight of the Interbike industry show. It will also solve a lot of logistical issues teams faced with the mid-week CrossVegas taking place over 1000 miles away from Jingle Cross. Iowa to Wisconsin with a week in between takes a lot of stress off of team managers. Jingle Cross will open the World Cup calendar the weekend before. Because of a conflict with University of Iowa football, Trek and Jingle Cross swap weekends with the Iowa race now opening the World Cup calendar. Trek CXC Cup, similar to most other UCI races in the U.S., has ensured men’s and women’s fields receive equal pay. That will continue in the World Cup race. A practice that European races may continue after seeing the U.S. lead in this area. Along with Sunday’s World Cup race, amateur races will take place Friday and Saturday. The 2018 Cyclocross World Championships takes place at Valkenburg, Netherlands. And here’s the full scoop straight from the Trek and CrossVegas promoters: www.trekbikes.com/us/en_US/world_cup_waterloo. (Waterloo, WI) – Trek Bicycle will host a UCI World Cup cyclocross race on Trek’s home course in Waterloo, WI, September 24 2017. The Trek CXC Cup, set to become the inaugural World Cup Waterloo, will feature a full weekend of events, including amateur and professional racing beginning Friday, September 22, culminating with elite men’s and women’s World Cup events on Sunday, September 24. In accordance with Trek’s longstanding support of equality, the company has ensured the men’s and women’s fields of this World Cup event will feature equal payouts. As in the past, the event will be free to attend with food, beverages, merchandise, and plenty of amenities available onsite. “We are delighted to welcome Waterloo as a new round of the Telenet UCI Cyclocross World Cup in 2017. With the support of the local community, we are confident that this event will be a great addition to our series”, said UCI Deputy Sports Director Peter Van den Abeele. Plans for the weekend, including a live webcast schedule, are currently ongoing and Trek will be communicating details regularly as they become available. January 27, 2017 (Longmont Colorado, USA) Watts Marketing, owner and organizer of Clif Bar CrossVegas, announced plans today for the 11th edition of the biggest cyclocross race in America. The race will be held on Wednesday September 20 in Las Vegas. 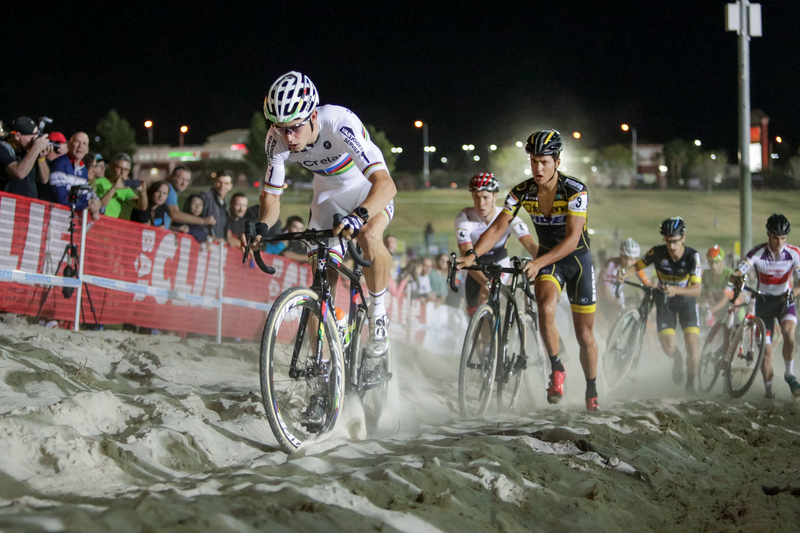 The kick-off event of the UCI Cyclocross World Cup series for the last two seasons, CrossVegas will be a Category 1 event on the 2017 international calendar announced today by the International Cycling Union during their annual meeting in Luxembourg. CrossVegas will take place on Wednesday evening September 20, 2017 and will include racing events for Women Elite, Men Elite, as well as a USA Cycling category race and the ever-popular Wheelers & Dealers Industry race. Racers from over 20 nations competed in 2016. Competitors included the world’s top-ranked men and women as well as multiple national and UCI world champions. Winners in 2016 were Sophie De Boer of the Netherlands and Wout Van Aert of Belgium. Perhaps no US city is better equipped to host an event like CrossVegas than Las Vegas, “the entertainment capital of the world.” The spectacle of CrossVegas – taking place under the lights with multiple course features designed to challenge racers and provide maximum spectator entertainment – is uniquely suited for Las Vegas. During the same week the city hosts Interbike, the largest bicycle trade show outside of Europe. CrossVegas provides a showcase for athletes and sponsors in front of the crowd of 12,000, including many bicycle industry representatives. In related news, Watts Marketing will be the organizer of World Cup Waterloo, a new race of the Telenet UCI Cyclo-cross World Cup Series scheduled for Sunday September 24, 2017 in Waterloo Wisconsin. The World Cup race, part of a weekend of cyclo-cross races and activities for all abilities, takes place on the grounds of Trek Bicycles world headquarters located a short distance from Madison Wisconsin.